Benjamin Dubansky, a developmental physiologist, received his undergraduate degree in Biological Sciences from Virginia Commonwealth University, and then his Ph. D. from Louisiana State University, Department of Biological Sciences under the mentorship of Dr. Fernando Galvez. He is now a Research Scientist with the Developmental Integrative Physiology Research Cluster at the University of North Texas, Department of Biological Sciences. Dr. Dubansky began his work on the Deepwater Horizon oil spill in May 2010, prior to landfall of oil, and has been heavily involved in understanding the basic science surrounding the effects of the spill on native species affected by the oil. He has also participated in regulatory science at the local, state and federal level for the spill and other environmental contamination scenarios. Dr. Dubansky’s expertise spans from the molecular level to whole animal physiology, incorporating a wide range of techniques to increase our understanding of the physiological responses that occur when animals are exposed to both natural and anthropogenic stressors. His work focuses primarily on developmental processes, where consequences can potentially be translated from individuals to the population-level. 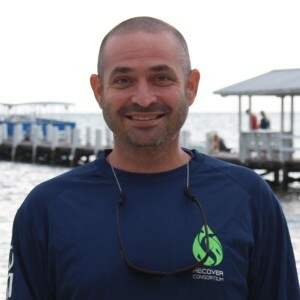 For the RECOVER consortium, Dr. Dubansky is working alongside Dr. Warren Burggren to characterize the effects of Deepwater Horizon oil on cardiac output and blood pressure in embryonic and larval mahi-mahi and red drum. This work in intended to shed light on the potential effects of sub-lethal exposure to oil on the long-term health of young fish that were exposed during the summer of 2010, and to increase our understanding of cardiac developmental physiology.